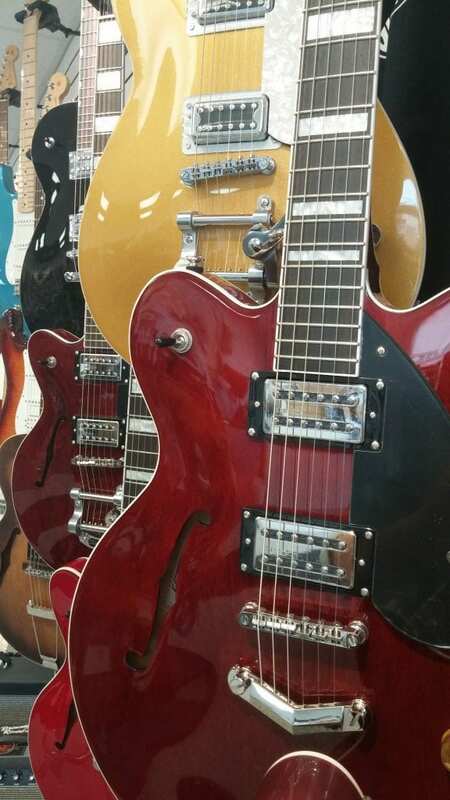 Murphy’s Guitars is proud to welcome Gretsch Guitars into our Bountiful, Utah store. Gretsch Guitars are world famous for their old school feel, look, and tone. These guitars have been played by some of the biggest names in music including: Jack White, Chet Atkins, Billy Gibbons (ZZ Top), Hozier, Tim Armstrong (Rancid), and so many more. Gretsch Guitars are the definition of “old school cool,” and would be the perfect compliment to any players lineup of axes. Gretsch specializes in hollow body guitars, but offers great options in both hollow and solid body guitars. The secret to the iconic Gretsch sound is their world famous lineup of vintage sounding pickups. The decision to include Gretsch Guitars in our lineup came following the release of their new Gretsch Streamliner series. The streamliner series features models varying in size, tone, features, and a full hollow or semi hollow body design. These guitars feature the new Gretsch Broad’Tron Humbucker, a number of great Gretsch original colors, 3 different body choices, and the option of either a hard tail bridge, or Bigsby Tailpiece. If you’re shopping Gretsch Guitars, or you just want to see what all the buzz is about, make your way down to Murphy’s Guitars at 133 North Main Street in Bountiful, Utah (just north of Salt Lake City). You’ll be glad you stopped in and tried out one of these iconic & timeless guitars. This entry was posted in Music, Sales, Store News and tagged event, Gretsch, Guitar, guitars, sale, Salt Lake City, Streamliner, Utah, welcome.